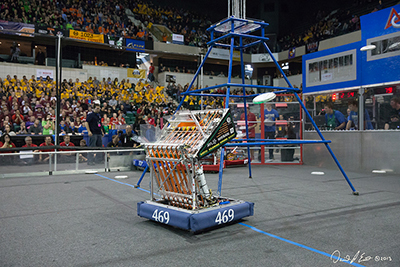 First in Michigan, a robotics competition for high school students, has expanded its tournament schedule with 21 district competitions being held this year compared to 18 competitions in 2015. Alpert says the state of Michigan has more high school robotics teams than any other state, with more than 410 teams. District competitions, which begin Thursday, will be held at high schools and universities across the state, including Midland Dow High School, Kettering University, Ann Arbor Skyline, and Southfield High School. First in Michigan doubled the size of the state tournament last year when it moved to the DeltaPlex Arena in Grand Rapids, allowing the amount of qualifying teams to expand from 64 to 102. She says the First Robotics teams are offered mentors from companies such as General Motors Co., Dow Chemical Co., and Ford Motor Co. The First in Michigan State Finals are set for April 14-16.